Braids are a convenient style to keep your hair under control while you perform every day tasks. They can also be modified for formal events to exude a more glamorous look. If you're going for a formal look, frizzy, fuzzy-looking braids can undermine the effect. Fortunately, with a little technique and the right haircare products, you can keep your braids from getting fuzzy, even in the most humid climates. Start by taking care of your hair to keep it strong. 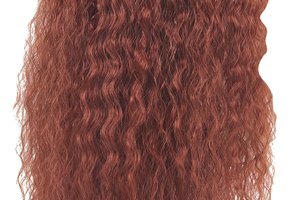 Dry, damaged hair tends to split at the ends and look frizzy. Take vitamin supplements containing Vitamins B, C, biotin, inositol, folic acid and beta carotene. Use deep oil treatment hair masks. Massage the oil into your hair, working it all the way down the hair shaft into the tips of your hair. Leave it on for half an hour to an hour before washing it out with shampoo. Wash your hair according to it’s texture. If your hair gets oily quickly, wash your hair once a day. If your hair is dry, don’t wash it with shampoo too often. Use a mild shampoo suited for fine or baby hair. Also look for shampoo products with a de-frizzing agents. Towel dry your hair. Then, use an anti-frizz styling gel suited to frizz-prone hair. Work the product into your hair using your fingers. Avoid applying it to the roots or scalp because it can make your hair appear oily. Pin your hair up and start with the bottom layers. Blow dry your hair on medium heat away from the direction of your roots. Always blow dry in the same direction as hair growth. Blow drying in the opposite direction will cause your hair to frizz. Brush your hair with a paddle brush to smooth it out and add shine. Divide your hair into sections, and braid it the way you normally would. To have glossy, shiny braids you can braid your hair into one thick braid or divide it into pigtails. These styles are casual and will keep your hair out of your eyes. If you want a more glamorous updo, try a trendy side braid. Take out a few wisps of hair and let them frame your face. Add an anti-frizz serum to your hair after braiding. A good serum can be a thick gel, which is applied to the palm of your hand and worked into the braid using your fingers. An alternative de-frizzing method is to use a shine spray, such as Citre Shine, to spritz your hair after you’re done styling. Don't let any of the hair products get on your scalp. It will make your hair look greasy. Wash you hair with cool water. Hot water will dry out your hair and make it look more frizzy. Thyroid problems can also cause thinning hair, which looks frizzy. If you notice a rapid change in your hair health, see your doctor.